scientific support. While wildlife surveys can provide New Mexico Department of Game and Fish biologists with insight to population trends, they don’t provide answers when a decline is documented. So, when biologists noticed a continued downward swing in elk calf survival around Mount Taylor, the question was: Why? Determining a problem exists and understanding the cause are two different puzzles, and getting the pieces into place can be challenging. The task becomes more daunting when researchers have difficulty finding and monitoring the calves. Above: Shawn Carrell, Jemez conservation officer for the Department of Game and Fish, looks on after releasing a cow elk. The elk was fitted with a GPS collar and a vaginal implant transmitter. The transmitter is designed to be expelled during birth, allowing biologists to locate the calves quickly to affix radio tags. NMDGF photo by Nicole Quintana. The only conclusions for which biologists are certain is that Mount Taylor elk herd numbers have been declining and calf survival rates have been low for more than five years. “Scientifically, we’re just not sure what is happening,” said Nicole Quintana, big-game manager for Game and Fish. In the summer of 2015, biologists captured 13 calves in the area and fitted each with an ear-tag transmitter, but the goal was to capture more. In a little over six months, approximately 50 per-cent of those captured calves were dead. While that amount of mortality might sound high, it’s actually good. To find answers, it was time to consider other options. While researchers have suspicions, they want answers. “Of the 13 calves, we saw some coyote predation, but the sample size was too small to draw any conclusions,” Quintana said. “We also would like to know if they suffer from bear, lion and possibly golden eagle predation. Or if another factor is at play. As it turns out, transmitters similar to those used to track wildlife can also inform researchers when cow elk give birth, providing locations where biologists can concentrate their efforts to begin monitoring larger numbers of offspring. Game and Fish personnel headed to the Mount Taylor area with the goal of capturing adult females instead of calves. 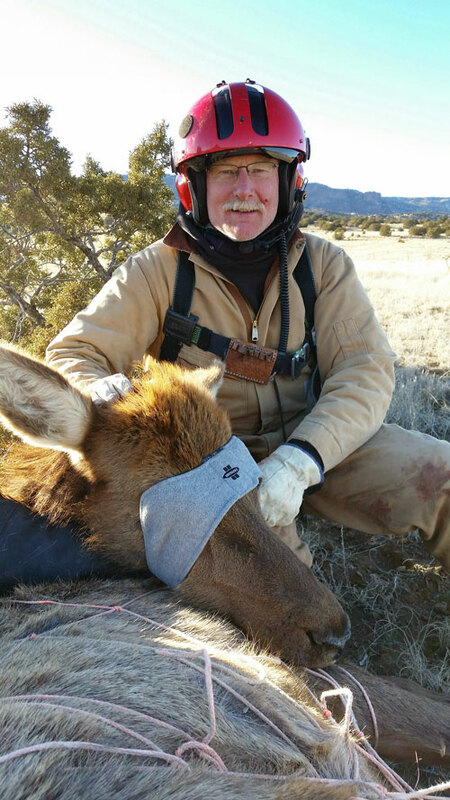 In February, using a helicopter and a net gun, the crew managed to capture 40 cow elk and suffered just one mortality. Of those captured, 30 received vaginal implant transmitters and were fitted with collars. The vaginal transmitters give off a special signal when the cows give birth and the collars help biologists find the location following birth. When the elk began giving birth in May and June, biologists traveled to the area and tagged the calves. Darrel Weybright, former assistant chief of wildlife management for the Department of Game and Fish, poses with the last elk he net-gunned before retiring in March. Department biologists are working to understand high calf mortality rates around the Mount Taylor area. NMDGF photo by Nicole Quintana. The project, partially funded by the Elk Enhancement Program — dollars received through the auction and raffles of two elk licenses is expected to continue for several years. And it’s important to find answers. In a healthy elk population, surveys indicate about 40 calves for every 100 cows. In the Mount Taylor area, Game and Fish biologists have been document-ing 20 to 30 calves per 100 cows over the last few years. Pitman said a stagnant or dropping population can have long-term impacts for the herd. 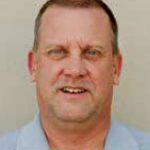 “You don’t want to have these low calf-to-cow counts for a long period of time,” he said. “At 40 or more calves per 100 cows, the population can handle natural predation and remain healthy and growing. However, when the recruitment remains low for years, the population begins to decline. Quintana and Pitman believe communication and cooperation has played an important part in the effort to find a cause for the low survival rates. The area for the study includes a variety of private, public and tribal lands. 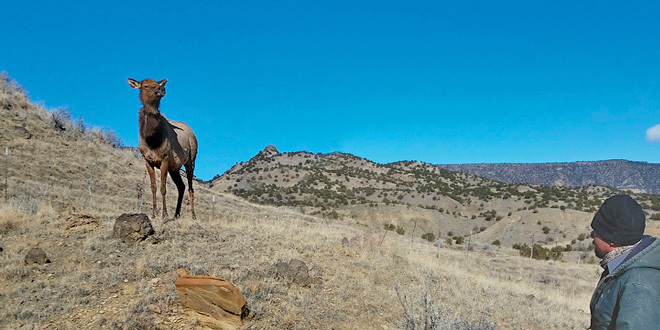 Once extirpated from New Mexico, elk have been restored to the state’s landscape with the help of sportsman dollars. Conservation efforts such as the current research of low calf survival rates will play an important role in maintaining a healthy elk population for future generations to enjoy.